Tomato Pappu mixed with a dollop of ghee and rice with Mango Avakai is a dearly loved combination and an integral part of everyday Andhra vegetarian food culture. Simple, earthy, soulful food! Tur dal aka Kandi Pappu with tomato is a winning combination and the addition of fresh coriander adds a perfect touch. 1 Heat oil in a heavy bottomed vessel, add mustard seeds, let them pop, add the cumin seeds, garlic, red chillis, and curry leaves and saute for few secs. Add the chopped onions, green chilies and ginger and sautÃ© till onions turn slightly pink. 2 Add the chopped tomatoes and stir fry for 4-5 mts. Add the turmeric pwd and salt and combine. 3 Add the cooked and mashed dal to the onion-tomato mixture. Add 1 cup water and cook for another 10 mts on low-medium heat. Garnish with coriander leaves. 4 Serve with white rice or hot rotis. Alternately, you can separately pressure cook onions, ginger and green chillis with tur dal and follow rest of the procedure. Perfect! Who wouldn’t love this soulful dal. Tomato pappu chala bavundhi sailu garu. Sailu garu can you post "KAKINADA KAJALU"? My husband like KAJALU a lot….but i dont know how to make? Very Nice. I will definitely try. I use tamarind pulp also. Is it not required in this version? I usually do not add tamarind. If the tomatoes are too sweet, I’d add a tbsp of tamarind paste. This dal is the reason behind all our visits to Andhra Bhavan! sailu garu,pappu is very tasty. We love this daal . I clicked to this as i wanted to see andhra touch in it …it’s like our punjabi peeli daal just our daal is devoid of mustard seeds n curry patta , bay leaf is used instead . And we do not mash the daal that’s it. Dal looks simple and colourful.I’ll try definitely try this. can i have recipes for akukuralato kuralu? sir/madam curry leaves are not available sometimes in super markets. then what to do? i cant store curry leaves in fridge for very long time. any other substitute available? like curry leaves in powder form?? You can dry them in the shade for a few days. Store in refrigerator and use. better way to store curry leaves is put tissue paper at the bottom of an air tight container & store curry leaves in it. store that containder in fridge.i usually do this process for all leafy items like corriander,pudina and even for ginger(i store cut pieces).by using this method they stay fresh upto 2-3 weeks. Dear Bhavani, my mom told me this wonderful secret of storing fresh leaves for a month. You can also put them in light carry bag with air in side and keep in fridge. You can use it for atleast a month. Quick Tip: If you add some finely chopped ginger and some chopped onions in the dal and boil it, it leaves an excellent aroma. Quick Tip: If you add some finely chopped ginger and some chopped onions in the dal and then boil it, it leaves an excellent aroma. 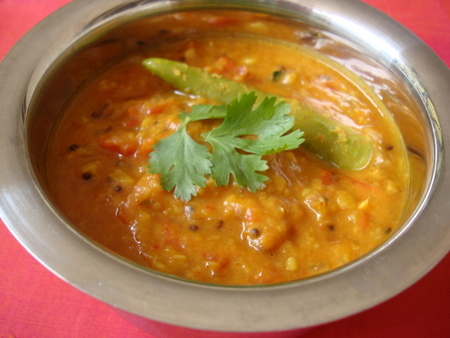 Quick Tip: Add some finely chopped ginger and some chopped onions in the dal and then boil the dal. It leaves an excellent aroma. I haven’t made this in a while, and the picture you have here is too tempting that I had to make it like now! My mother’s version had both garlic and hing, minus the ginger. My tomatoes weren’t tangy enough today, and my dal could have been tastier.